*********PLEASE CHECK CALENDAR, ABOVE, FOR AVAILABILITY. ************ IT IS UPDATED DAILY AND ACCURATE!!!!! BUILDING IS RIGHT ON THE BEACH.... 4000 GULF BLVD. 4TH FLOOR UNIT. ELEVATOR ON SITE. VISTAS ON THE GULF. ONE OF THE FEW UNITS WITH A KING SIZE BED IN MASTER AND A VERY STURDY TWIN OVER FULL BUNK BED SET IN 2ND ROOM.........PLEASE VIEW ALL PHOTOS TO SEE WHAT UNIT OFFERS AND TO SEE VIEWS FROM THE UNIT....COVERED PARKING INCLUDED! Enjoy the Gulf front, prime location of this condo building. View beautiful sunsets over the Gulf of Mexico, right from your own 4th floor balcony. 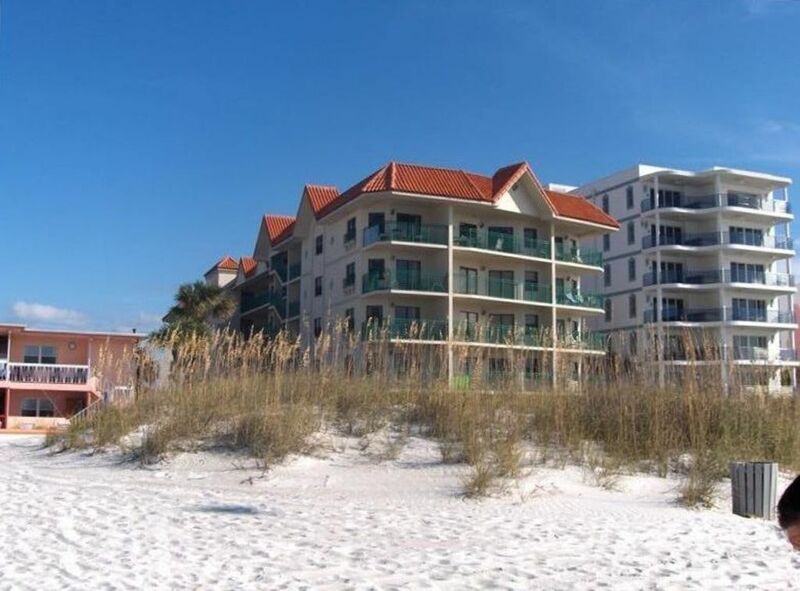 Set foot right onto the warm sand as you exit your condo building. With large, heated pool and hot tub, you will relax in style. Offering over 750 square feet, the entire unit has recently been updated with fresh paint throughout, brand new King Size Bed, in the master bedroom, and brand new Twin Beds in the second room. All carpeting has been removed and tile has been put in, for all you allergy sufferers. New Living Room Furniture to include Queen Size Sofa sleeper. Located in the heart of St. Pete Beach, you are walking distance to shops, restaurants, ice cream, groceries, etc. No need to rent a car as the airport shuttle can drop you off at the front door within 25 minutes, if you like. There is a Trolley that spans from Pass-A-Grille up to Clearwater, and passes every half an hour. All major theme parks are 90 minutes away... All the amenities are on site. We even provide the beach towels. Come and enjoy your stay. Located at 4000 Gulf Blvd, St. Pete Beach, unit 410. Thank you for visiting our site. We are your hosts, Steve and Jeanna. With 3 little ones we visit Florida, regularly, and after many years of experiencing different locations, we fell in love with St. Pete Beach. We purchased our unit in 2008 and have been blessed in meeting and dealing with great families, such as yours. We have been married for 17 years and live in Illinois. Looking forward to talking with you soon. Jeanna and Steve. Jeanna and I have been coming to St.Pete Beach for over 20 years. My folks own a timeshare, near by, and introduced us to St. Pete. We love it. It has everything you look for in a vacation spot. Our condo is situated on one of the nicest beaches in Florida. The views are incredible and the amenities are, simply, too much to list. Having everything you need within walking distance truly makes for a great location. Our unit is well maintained and is always in 'like new' condition, when you arrive for your stay. We hope to hear from you. ALL THE AMENITIES ARE PROVIDED FOR YOU. ENJOY UNLIMITED NATIONWIDE CALLING IN THE U.S. AND CANADA, ITS ON US.. In Living Room with iPod docking station. Walking Distance to Shops, Restaurant, Groceries, and Ice Cream. All the Amenities Needed. 1 Hour from Disney, SeaWorld, Busch Gardens and Other Visited Theme Parks.. This is the second time we’ve stayed at Vistas on the Gulf. My wife and I have two young children and the convenience of the property makes our visits pleasurable. We love that the pool and beach access are right at your fingertips. The units are spacious and there’s not a bad view anywhere on the property. It’s also easy in, easy out to the Pinellas Bayway and 275 N/S towards downtown St. Pete and the airport. We will definitely return to this property when we vacation in St. Pete Beach. It felt like a real hotel stay and we absolutely loved it!! The apartment had everything we needed and so much more. It was our first time trying out VRBO and so we were initially skeptical about what we were going to find. However, from the moment we walked in, the unit was very clean and presentable - similar to the impression you get when you walk in to a hotel room. The beds were made with very clean sheets. The bathrooms were clean and included clean white towels, toilet paper, hand and bath soap, as well as, hair dryers. The kitchen was very lovely and was also well equipped with paper towel, dish detergent, pots and pans, cooking utensils, corkscrew opener, can opener, coffee maker (w/ filters), George Foreman grill, and so much more. All you need to bring is the food and your own spices and seasonings. In addition, everything we needed for the beach was available in the unit including beach chairs, beach umbrella (about 6' in diameter), soccer ball, and a mini cooler. The beds were very comfortable. The master bedroom had a very nice King size bed and plenty of pillows. The second room had a bunk bed with a Queen size mattress on the bottom and a twin size above. Each room had its own TV with cable. We loved having a washer/dryer in the unit which allowed us to wash our beach towels and re-use the next day. The pool area was nice too especially as it had a jacuzzi and a grilling area with two gas grills. All you have to do is turn the knob and the gas comes from directly from the building so no need to bring your propane gas. Beach access was very easy and we loved having two showers in the pool area - one for when you come in from the beach and the other one near the pool for when you are set to go upstairs to your unit. Overall, our family absolutely loved staying here. The property management team is always there and very friendly. We highly recommend a stay here and hope that you will also enjoy it just as we did!! We really enjoyed staying here over the 4th of July!! We would have benn able to see fireworks from the beach out front. It rained but that’s ok we could see them from the balcony right outside the front door. This was an amazing space that had everything we needed. Very nice condo. Family friendly and never had a hard time finding pool chairs. Great place to stay. Office check- in staff was very friendly. We enjoyed it very much! Thank you! WAVE-RUNNER RENTAL ON THE BEACH. PARA-SAILING RIDES ON THE BEACH. BEACH CHAIR AND UMBRELLA RENTALS ON THE BEACH.